We often talk about ‘searching the literature’ – but how do you actually do it? Literature searches are one of those skills that we assume students already have when they get into a PhD. As a consequence we rarely make time to explicitly teach the skills, so it’s probably not surprising that I meet many students who feel like they aren’t doing it ‘right’. Many of these confused students are too afraid to ask for help from their supervisor. I think the fear comes from the feeling that you should know, even if you have never been properly taught. This fear, by the way, is a good example of the effects of what my friend Dr Mary-Helen Ward would call the ‘hidden curriculum’ of the PhD. The hidden curriculum is created by the environment in which you are located and instills you with the norms and values of your academic culture. Think about it: admitting incompetence is a loss of face and undermines your academic authority with your peers. Hence the fear of admitting you might not really know how to search the literature thoroughly or efficiently. Lucky for those of you who are feeling this fear, there’s plenty of good, free advice about how to start searching the literature on the internet and many university libraries offer guides and courses. The research training team at ANU curate these resources on social media have compiled a database with literally thousands of useful sites. These resources will get you off to a good start, but you can quickly find yourself stuck in mud. This is because most of this advice is in the form of context free lists of ‘dos and don’ts’ which are hard to operationalise in practice. For instance, we all know that the first step in searching the literature is to type keywords into a database and get results, but how do you generate the keywords in the first place? Do you just … guess? Well – yes. Sort of. As you have probably already found out, guessing will only get you so far. You have to be systemmatic about generating keywords – and creative at the same time. Not an easy ask. In fact, searching the literature involves a surprisingly sophisticated set of thought processes that take a long time to learn. I’m going to outline one method of being systemmatically creative about how you search the literature. This is the way I do it, but there are probably as many ways as there are academics and I’ll be interested in what advice you might have to share in the comments. 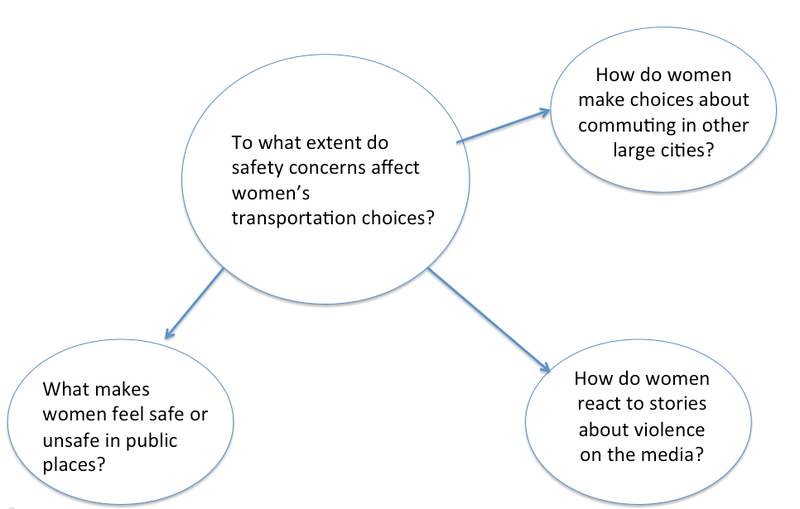 To what extent do safety concerns affect women’s transportation choices in large cities like Jakata? You might have noticed I work in threes when I use a spider diagram. This is a way of creating hierarchy and limiting the scope, so the task doesn’t become unmanageable. I’ve documented more about how to use this diagramming process in a downloadable cheat sheet here). 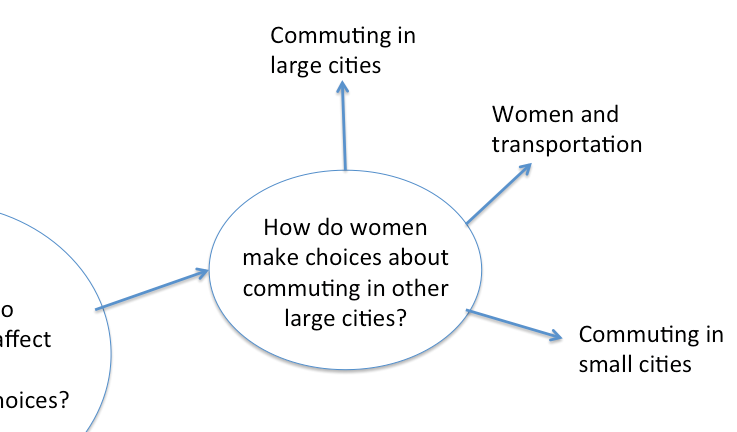 ‘Commuting in large cities’ is what I call a background topic. If I type this in I’m likely to find literature I need to know to appear credible to other academics researching in this area. 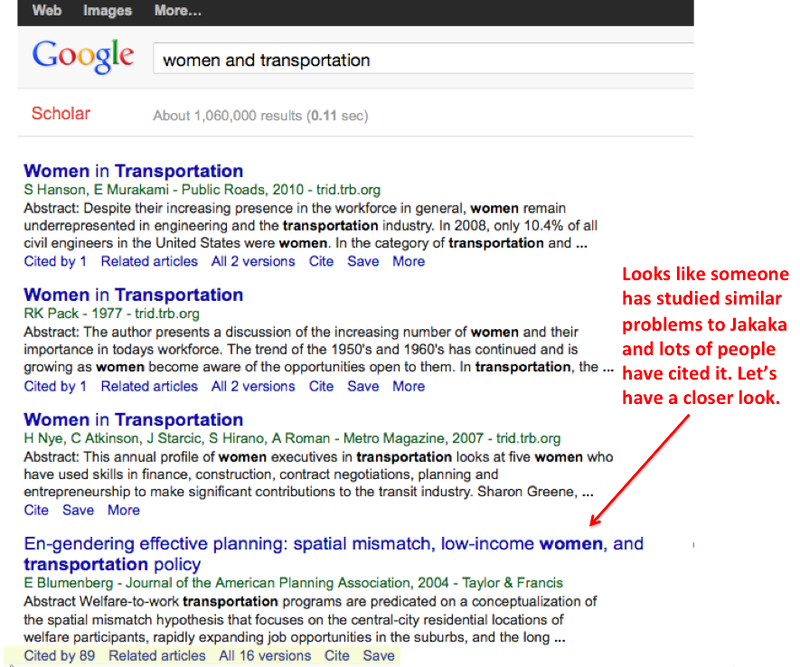 ‘Women and Transportation’ is an obvious topic. If I type these keywords in I will find researchers working in my immediate neighbourhood. 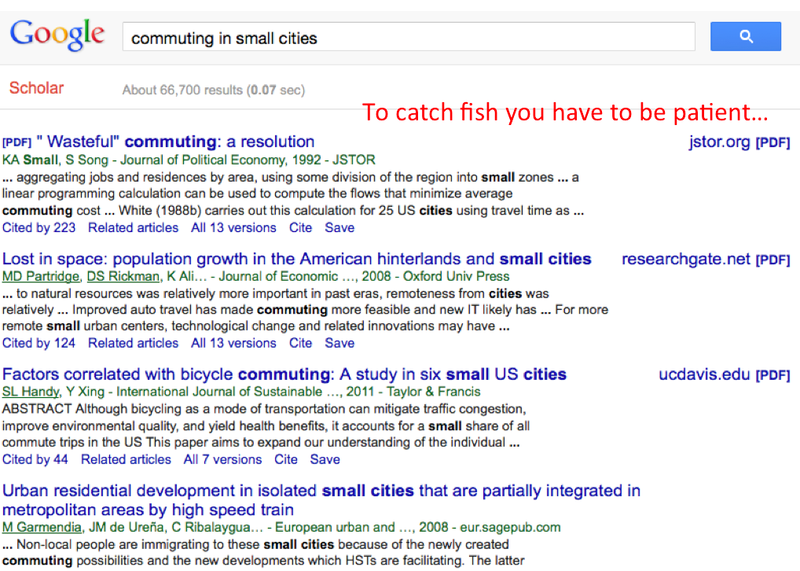 The final topic, ‘Commuting in small cities’, is what I call the going fishing topic. By deliberately inverting my search I might find something interesting – I’m not sure what yet. This is an example of deliberate systemmatic creativity in action. 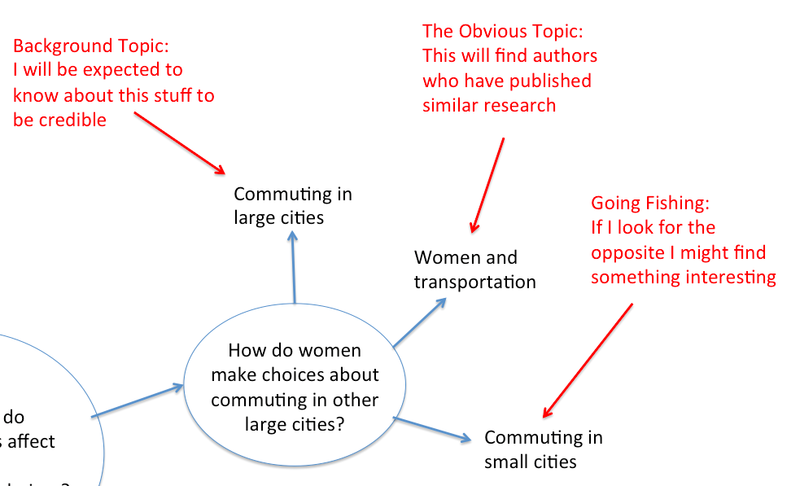 All the hits are relevant, as you might expect, but the last hit on the page looks most interesting “En-gendering effective planning: spatial mismatch, low income women and transportation policy”. 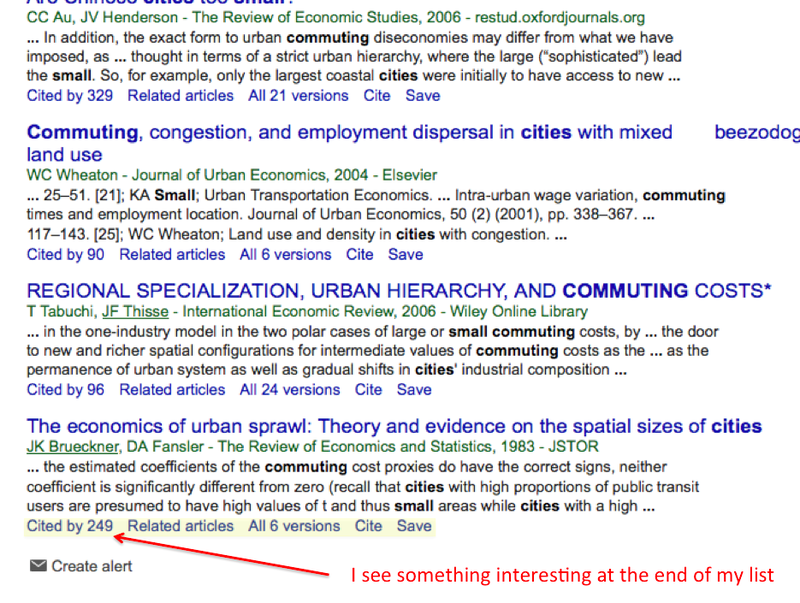 I’ve run a highlighter over the information Google gives me – most important is the number of citations. The number is quite high, which tells me people seem to have found the article useful. 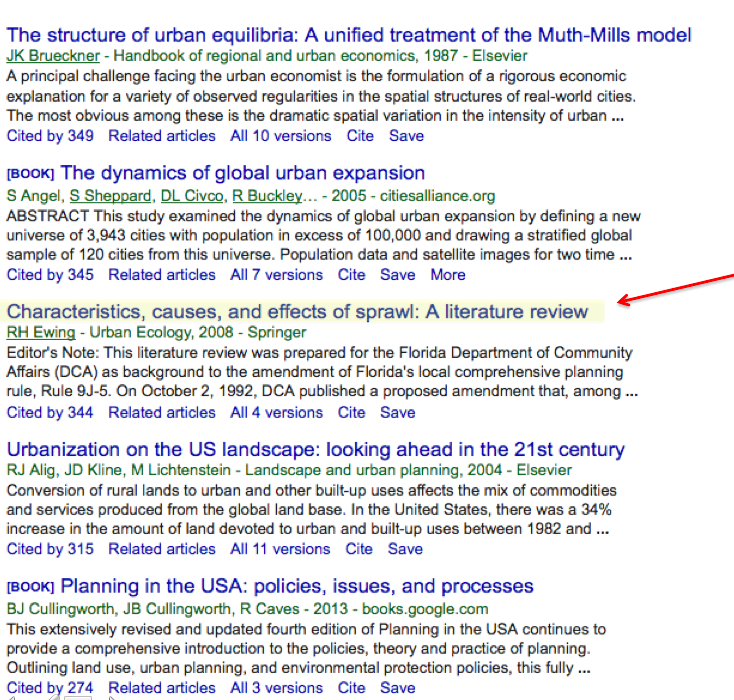 ‘The economics of urban sprawl’ looks has a fair number of citations. Let’s take a closer look, who has cited this paper? Third hit down is a literature review. A great find – hopefully this paper will contain a carefully curated list of literature and critical commentary. Why does searching for the opposite sometimes help us find exactly what we need? I’m not sure, but it never fails to turn up something interesting. Give it a try and see. I could say so much more about searching the literature, but now I’m interested in what you think. Do you use any of the techniques I’ve described above, or do you have others to share? I’d be interested to hear about them in the comments. This entry was posted in Getting things done, On Writing and tagged literature review, literature reviews. Bookmark the permalink. « What’s it like to be ‘finished’? The one thing that’s missed from this post is the role of the librarians. While the post mentions the research training team, I think this overlooks the hugely helpful role librarians, research trainers, and academic skills advisors etc can play. Not only do libraries offer training in literature searches and using research resources (often called information literacy or user education), but you can get one on one assistance that will help you come to grips with both the resources that are available and the tools available to search, find and access them. Occasionally (and unfortunately) you may be brushed off; but persevere! (librarians are human too and have bad and good days like anyone else) Make use of the online resources provided by the library – they’ve done the hard work of checking quality. Talk to the faculty librarian(s) – there’s usually one or more assigned to your faculty. Most librarians are delighted to have someone come into the library wanting to know more about what’s available. Yes, walk across campus and actually talk to someone. I lecture in library and information studies, so I may be slightly biased here, but even knowing what I know, I still make good use of the librarians to help with these searches, find out about new resources, locate the perfect item I’ve found via Google Scholar that isn’t full text, and do the inter-library loans. A good librarian is better than gold (well, at least as good as gold?) for getting into research literatures, and for getting good results from tools. Getting to a good question is every bit as important as finding good literature, and good ‘answers’. I completely agree. The librarians in my department’s library (I’m at the Uni of Melbourne in Education) are amazing people and amazingly helpful – I’m constantly referring people over to them to find sources and set up automatic searches in databases. For me, the problem around literature is that there is far too much of it, and it’s being produced in large volumes, very quickly. Privacy is a hugely popular research topic, across technology, law, and social sciences. Since my research integrates evidence from these domains, I have to find ways to sift through, and then weld back together, threads from disparate perspectives. My argument is requiring me to demonstrate the core of my claims to be able to demonstrate them. Finding the language used in different domains for the same/similar ideas looks straightforward, until you read into the literatures and discover the subtle differences in how words are used, and what they are used to mean. I recently had to do a systematic review of the literature for my boss that involved using the same search terms across a number of databases. I had a list of exclusion criteria and that meant that I had to read hundreds of abstracts. This took up a lot of time. If only I had found this article before commencing the work. I am tempted to go back and try searching using google as that was not one of the search engines required for the review. thanks – but Google would never have found everything you were able to find by doing it the hard way! Good on you for sticking with it. Very hard work. Reblogged this on Rising Thoughts…. I find it interesting when people describe how they do their lit searches, as there are so many ways. Just one question: having done a number of systematic reviews, I’ve found the best search engine to be Google Scholar (at least for the initial sweep and identifying primary sources) before moving on to the library databases. My reasoning is that Google Scholar has the capacity to identify grey literature, not always picked up in the databases, and also that it seems more amenable (if that’s the right term) to different combinations of keywords… compared to having spent time waiting for a frozen database to come back to life. Thanks again for an interesting post! Yes, Google does not index everything, not by a long shot. I only used it as illustration because there are so many databases with so many peculiarities. It would be impossible to describe a procedure that could be replicated by anyone. Can I add though – a lot of these databases are desperately old fashioned and hard to use. They could all learn a thing or two from the Google approach. Google scholar has its limits but it is a great way to find key words because you can search using natural language to pose your question in various ways, choose papers that seem relevant, check out the key words they have used and gradually expand your list of search terms and phrases to use with other databases. First step: Also, ask a librarian for help. WE are the expert searchers and are most qualified to teach how to become a “searching ninja.” That isn’t to say that others can’t be very good searchers, but librarians are the experts. Further, you can do all the searching you want, but if your question isn’t properly formed to begin with, then you’ll be wasting a lot of time. Start any search with a quick call or visit with your favorite librarian. Respectfully, I have to disagree. Not with the claim to expertise, but the use of librarians as a first stage resource. There are just not enough to go around and most I meet are desperately overworked. The the procedures described in this post should be able to be done by any PhD student without help from a librarian. Librarians should be the second or third step after you have done some searching for yourself. They can teach you a lot – but it helps to have something to build on first. It’s even good to make a few mistakes in the search process – the learning is more easily consolidated that way in my experience. Thanks for posting the interesting lit search strategy. It is a helpful startup sweep of the literature. I always try to find out a well cited review article which further leads me to selected lit content. However, I am interested to learn how the research in a particular field is trending in the past few years. How can I check the metrics/number of articles being published by year wise? That’s a good question for a librarian 🙂 They are expert in this kind of thing. There are various ways of doing this, and it depends on the particular field as to the kinds of tools available. They will know what’s available for the field you are interested in. And look for articles that cover metrics in the field, although given the nature of publishing, you are likely to find data that is up to 2012 or 2013 but not more recent. I agree – librarians are an invaluable resource. Unfortunately there are not enough of them to go around in most universities. We need to be careful of building a dependency culture. I think it’s important that everyone learns the basics (which is what this post is) so we can all make better use of librarian time for the harder stuff. Great article, and well done for drawing us in with a compelling title for the story too! Thanks. Reblogged this on signal to noise. This has been super useful – thank you! In September I’ll be starting a Masters and being a literature searching ninja will definitely come in handy! 1. 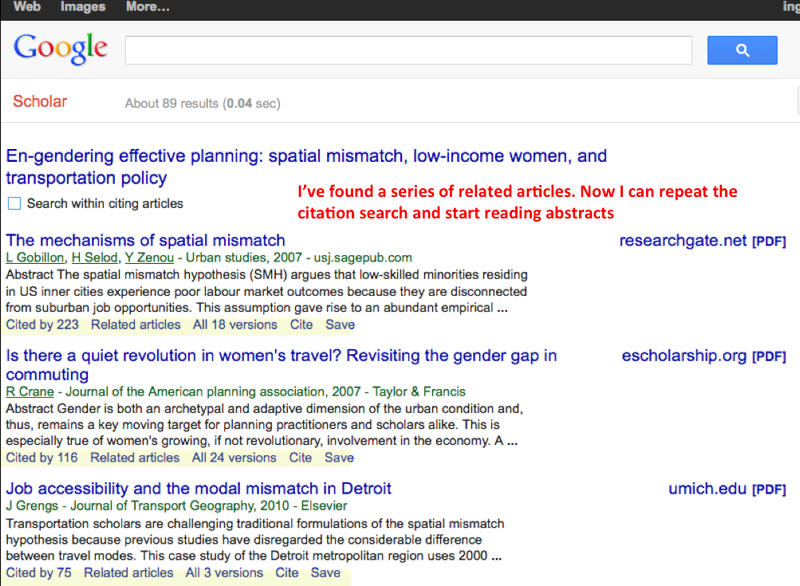 Search Google Images instead of Google or Google Scholar. I am amazed how many times I found relevant articles and papers this way that did not show up in the first many pages of the other Google searchers. Also, the image that you see gives you a good idea whether the source might be interesting. 2. Wikipedia. While one can’t trust the Wiki article, there is often a useful reference list and relevant links. I had taught Literature Research Process (not necessarily just ‘searching’) to PhD candidates for several years, but discovered much of the dissertation work should have required, not Literature searching, but Social quantitative and quantitative research methodology as well. If it is any help to anyone, I found David Royse’s book, Research Methods in Social Work to be exceptionally good at outlining the process. That is a good way to research. I have been guessing topics, and when I find what I am looking for I use the references from that literature sometimes. I will have to try it your way next time. Great post. Litereature students from kenyatta university(http://humanities.ku.ac.ke/) find it full of insight. Thanks Inger, simple but very useful and clever technique! The fishing idea is inspired! Quick question – Do I look at the articles resulting from the “library shelf labels'” search through the lease of the main question, or do they almost become standalone themes the lit review? Thanks 🙂 In my experience it can be either – the act of trying to visualise labels on the shelf makes conceptualising and categorising the literature more concrete. CAUSES AND EFFECT OF DELAY IN OBTAINING DEVELOPMENT PERMIT IN ROAD CONSTRUCTION. Thanks for the great method, the was very helpful for me. I’m facing a challenge that might seem relevant/familiar to other readers. I usually find a gap between defining the 3 sub-topics (background, obvious & fishing) and breaking the main title down into 3 logical and coherent constructs. In other words, my main 3 constructs are usually not fitting with the (background, obvious & fishing) classification. Is it my way of implementing the method (wrong)? or the gap/mismatching is acceptable? Kindly advise. I am on of those who are having difficulties in hitting the relevant keyword to begin my literature review. I haven’t had experienced in doing research before. Your writing here really helps a lot. I’ll try this straightaway. Thank you!